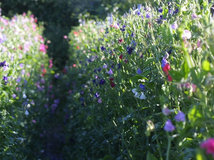 Does your garden resemble a jar of jumbled jelly beans — wildly colorful but with no real sense of cohesive design? 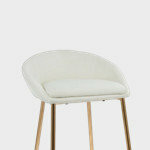 Try toning things down with a monochromatic color scheme. 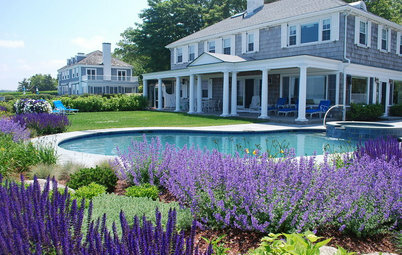 Select just one color but use a variety of tints, shades and hues — for example, pale blue, rich cobalt and blue-purple. 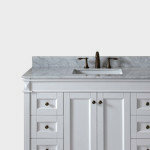 Far from being boring, this type of restraint allows the focus to be on the juxtaposition of textures and shapes. Foliage, flowers or a combination of both can be used to create a magical effect that will have you reaching for your camera rather than your sunglasses. 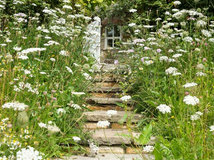 You don't need to commit to an entire garden in a single palette, such as the famous White Garden at Sissinghurst in Kent, England. 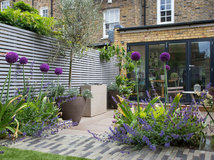 Design a unique border or just a container to explore the possibilities. 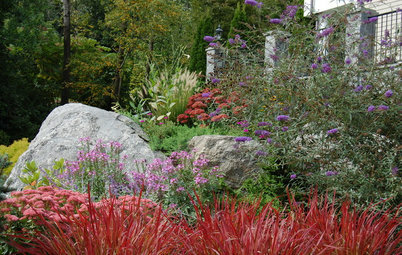 Or separate high-color-contrast plantings in the garden with a monochromatic vignette to give the eye a soothing place to rest. 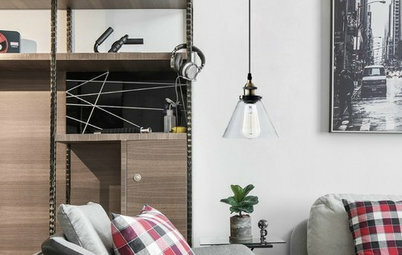 Design for year-round interest or just one season — you'll soon be wondering why you ever thought that monochromatic design would limit you. Talk about making a statement. The entrance to this blue garden at Lotusland, in California, has to be one of my favorites. 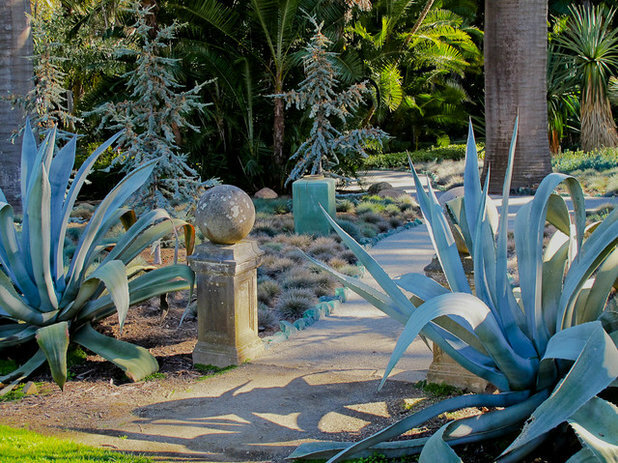 Large architectural agaves (USDA hardiness varies) stand sentry while two blue atlas cedars (Cedrus atlantica 'Glauca', zones 6 to 10) contrast with these bold succulents. Hummocks of blue fescue grasses (Festuca glauca) resemble a herd of spiky blue hedgehogs in this fantastical display. 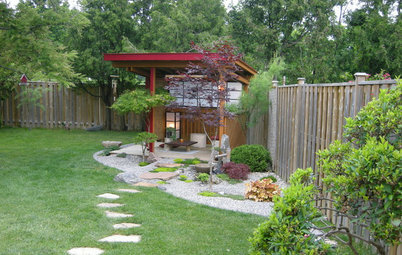 Using containers, fabrics and decorative accents to reinforce the color scheme adds interest. Here the pathway is even edged with large chunks of translucent blue glass. 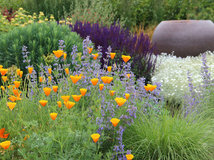 All of these plants are drought tolerant and thrive in well-drained soil in full sun. For a more romantic look, combine cottage garden favorites, such as fragrant catmint (Nepeta sp) with perennial sage (Salvia sp). 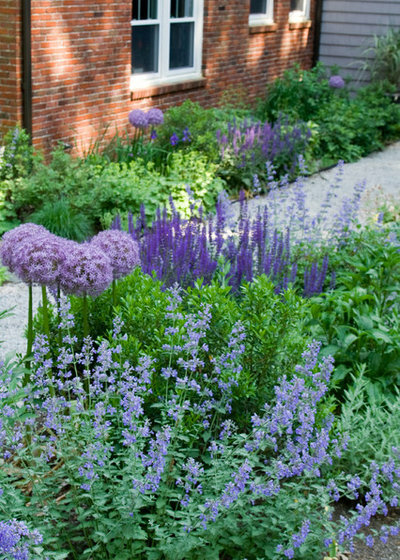 Their mounding forms are punctuated here by spheres of lilac alliums, held aloft on sturdy stems. 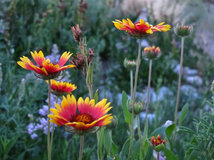 This is a great drought-tolerant summer trio for full sun. 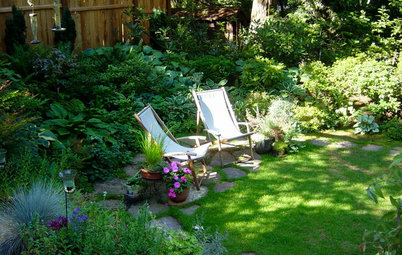 This is perhaps the quintessential monochromatic garden. 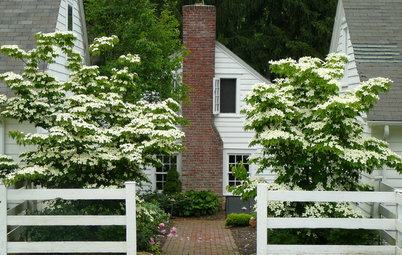 Fences are festooned with white sweet autumn clematis (Clematis terniflora, zones 4 to 10), while clipped boxwood hedges corral billowing mounds of white roses and hydrangeas. Elegant, sophisticated and formal, this is truly a classic look that will never go out of fashion. 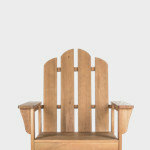 The design is held together even when no flowers are blooming, since the home itself continues the theme. 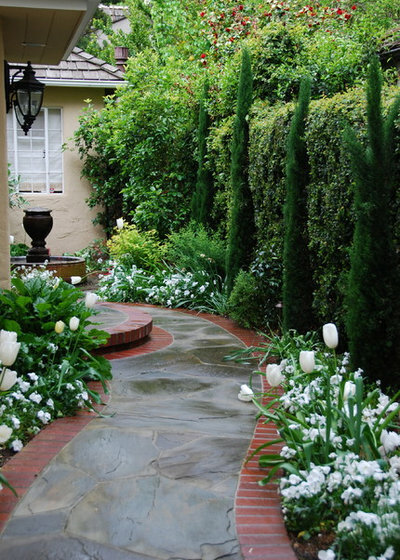 If you like the idea of a white garden but don't want to commit to such a large area, try flanking a pathway with a simple springtime combination. White daffodils or tulips could join pansies or white forget-me-nots (Myosotis sp, zones 3 to 8) for an early-season display. In a shadier spot, a mass planting of snowdrops would be delightful. 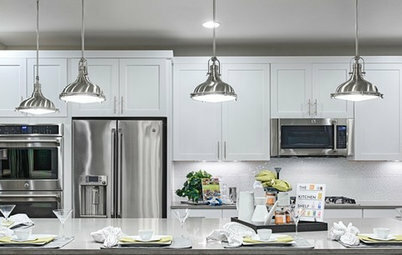 For a fresh spin on the classic white garden, choose silver. This combination is all about the foliage. 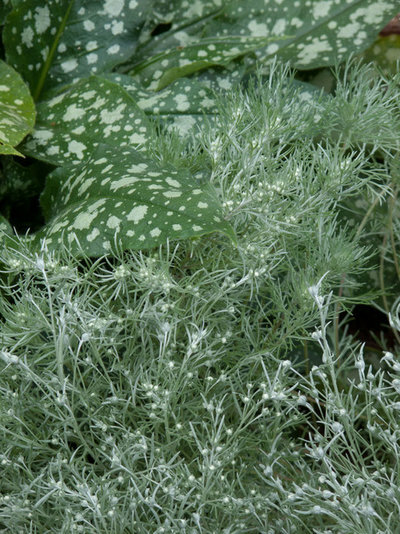 Soft, feathery mounds of 'Silver Mound' wormwood (Artemisia schmidtiana) contrast with the rough texture of the larger, spotted lungwort (Pulmonaria officinalis) leaves. The success of this combination took me by surprise in my zone 6b garden; both are thriving in full sun with minimal water. I always thought lungwort needed partial shade. Just goes to show it's worth experimenting. 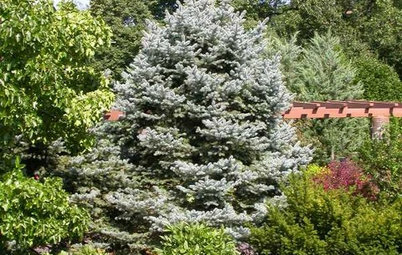 "Acid green," "chartreuse," "apple green" — these are all terms we use to describe that zesty shade we have come to love in our gardens. Here the flowering bracts of spurge (Euphorbia sp) burst into color like a wild bouquet, their color repeated by the flowering kangaroo paw (Anigozanthos sp) and assorted golden grasses. 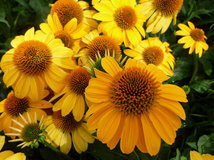 This combination is successful in part thanks to the sheer mass of a single plant. 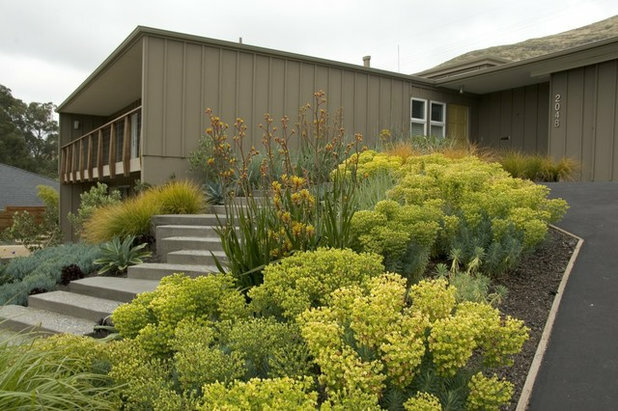 The monochromatic scheme is at its peak in late spring, but since the grasses and spurge are evergreen, in many zones the structure will remain in a hot, sunny spot like this throughout the year. 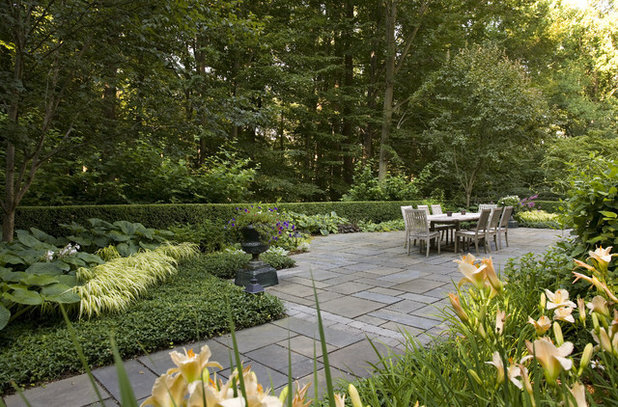 Shady woodland gardens are one of my favorites to design. 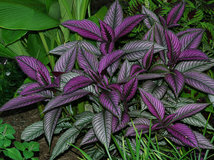 Their success depends largely upon combining interesting foliage textures and playing one shade of green off another. 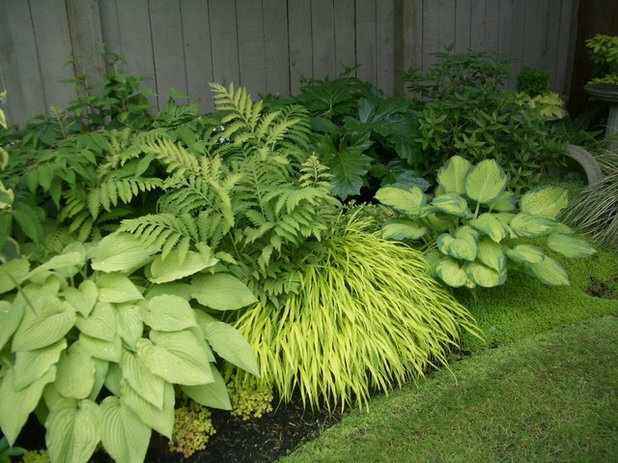 This design beautifully partners Japanese forest grass (Hakonechloa macra 'Aureola') with assorted hostas, astilbes and ferns. 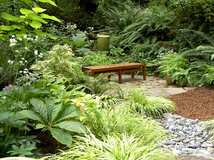 The result is a soothing medley that will thrive in partial shade, in average to moist soil, in zones 5 to 8. 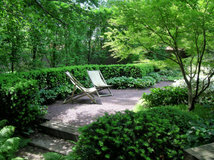 It can be a challenge to create a monochromatic garden when both sunny and shady environments have to be considered together. 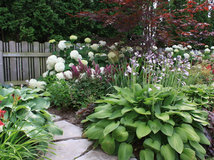 Here the designer has added soft apricot daylilies (Hemerocallis hybrids) to the sunnier side, echoing the colors of the shade-loving grasses and hostas. Butter-yellow roses, such as 'Graham Thomas', would also have been pretty. 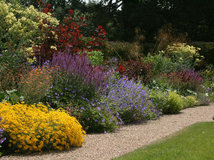 Or perhaps a sweep of 'Mellow Yellow' spirea (Spiraea thunbergii 'Ogon', zones 5 to 9). Want to punch up the color? How about rich gold with a hint of tangerine? 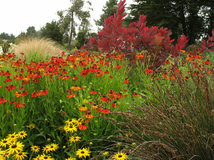 This trio would work equally well in a large container or garden border. 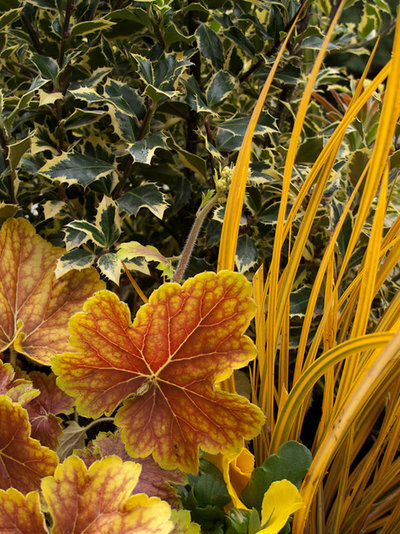 The yellow variegated 'Gold Coast' holly (Ilex aquifolium), strappy 'Goldfinger' New Zealand iris (Libertia ixioides, zones 7 to 11) and colorful 'Delta Dawn' coral bells (Heuchera, USDA zone varies) are all evergreen. 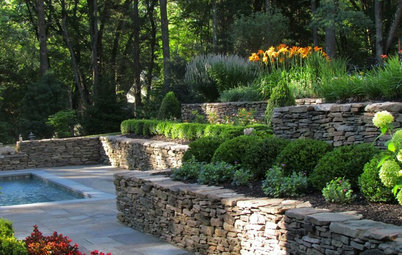 Tuck a few yellow pansies in for an extra splash in spring, and you'll have sunshine year-round. From peach to rust and magenta, this color palette offers warm shades that look like they would melt in your mouth. 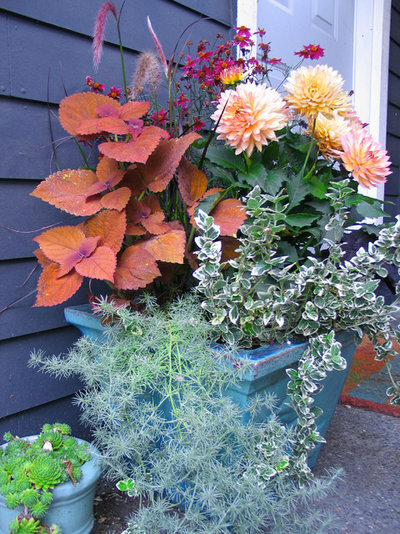 Cluster sun-loving 'Sedona' coleus, dahlias and other similarly colored annuals in a sunny container for an easy monochromatic medley. 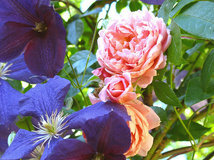 Paler shades of pink can appear washed out, especially in the heat of high summer. Add magenta to the mix, however, and it really comes to life. 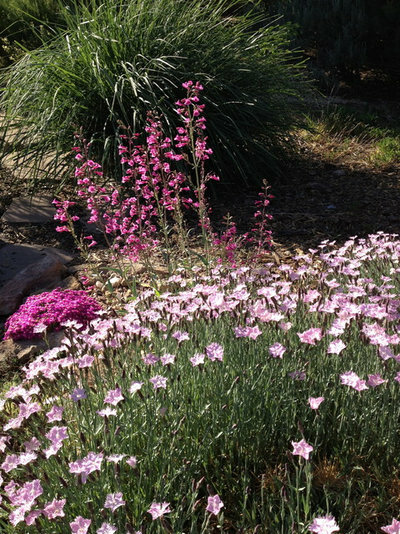 The cushion of rockery pinks (Dianthus sp, USDA zone varies) in the foreground is joined by other drought-tolerant plants in this sun-loving combination. 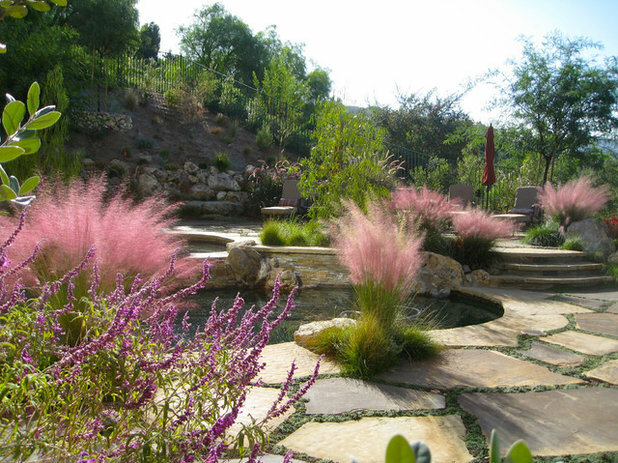 Pink muhly grass (Muhlenbergia capillaris) is one of the most dramatic for late-season color. 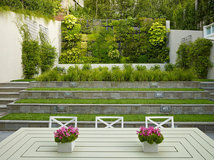 Rather than massing these in a single border, the designer added them throughout the space, effectively moving the eye around this beautiful garden. The pink-purple beard tongue (Penstemon sp, USDA hardiness varies) in the foreground adds a nice touch. Dark and sultry meets bright and shiny in this fabulous pairing. 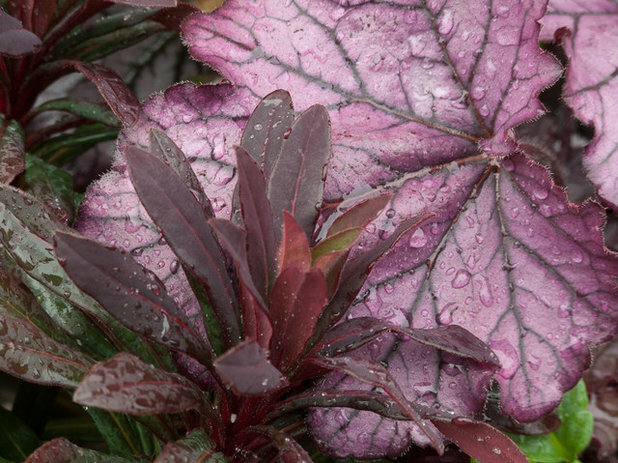 The larger leaves of 'Spellbound' coral bells (Heuchera) glisten with a soft metallic sheen, providing an exciting backdrop for the narrow, velvety foliage of 'Ruby Glow' spurge (Euphorbia amygdaloides). This new sun-tolerant coral bells cultivar is happily sharing a container with the spurge in my zone 6b garden. 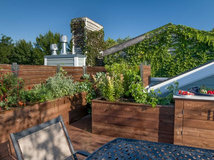 Whether you prefer bold and bright shades or a cool and sophisticated palette, a monochromatic color scheme can help bring definition and a touch of designer magic to your garden. Which color will you choose? Gorgeous, like the idea and look of the same-themed hues. 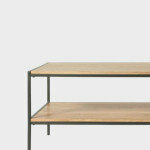 Allows for continuing variety, but within the framework of a defined perspective and palette of shades. My garden is almost entirely shades of purple. Being new to the area, I used a landscape gardener to start me off and after the 1st growing season, when I asked why there was so much purple, he replied "Is there? I wouldn't know because I'm color blind." Oh well!!! 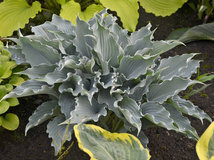 Olga, I live in zone 4 and I have Hakonechloa macra 'Aureola' growing well in my garden. It even survived last winter when temps reached a low of -65F. It was buried in snow so that helped protect it from the cold.